Didn't the first autocockers came with a plain panel shroud? Wouldn't be the same for the mini cockers? IIRC, the MiniCocker was supposed to have some extras, like the cut backblock and gilled shroud and the short, dark green anno barrel, in order to help differentiate it from the it's full size brother. The Minicocker shroud was shorter as well, because the gun was shorter, so it made sense to differentiate the shroud further with the decorative milling. Do you know when they first release the minicocker? and when they started to use the sledge? That gun has lots of good mojo. Yes buddy! I couldn't agree more! 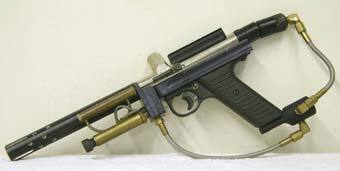 a lightened,smaller, hand built and balanced gun. But I can't say how long cockers used those horrid stock regulators. Want to know how bad they were? I tried to find a picture on the internet, and I was unsucessful. It seems every single one was replaced! Last edited by HP_Lovecraft; 06-16-2017 at 07:16 PM. Awesome article hp. Bob long can hook me up with a rock reg and swiftline mods Good to know. The early cockers did not not have a threaded timing rod. I don't think the minis had them either.